My perennial bed is certainly not a manicured, mulched space. It's a true country garden, a cottage garden of sorts. But even a cottage garden needs to be tamed from time to time, or it will soon get out of control. Last season, I had just moved into my house, and I had no clue what the previous owners had planted in the garden. I had to let things grow, to see what came up. By the end of the season, you could barely walk up the garden steps, everything was so out of control. This year I know better, and I can get more of a handle on things. 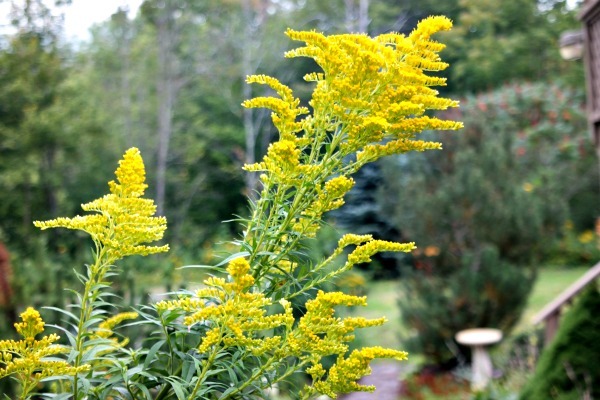 For starters, I have been yanking out all the Goldenrod. I do like it, but it doesn't belong in the perennial bed. It can grow wild at the edge of the woods, and I can enjoy it there. And the Tansy was out of bounds last year. I mistakenly thought it was Achillea, until one of my sweet readers corrected me. Now that I know what it is, I know how to handle it. 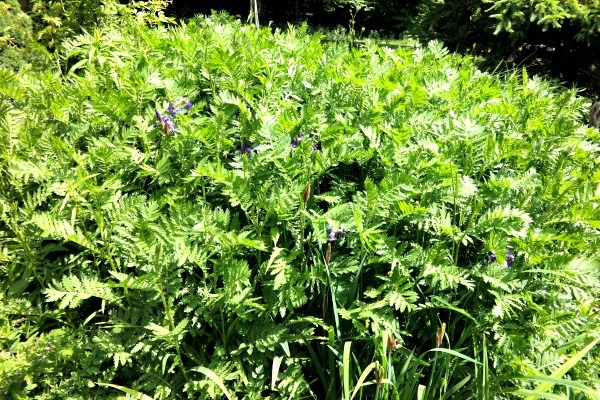 This was the Tansy smothering a bed of Irises the other day. Yesterday, I decided it was time to get out the wheelbarrow, and the garden shears, and cut this baby way back. ....and the garden has form again. I cut the Tansy back to about a foot tall, this way it hopefully won't be 7 feet tall when it blooms, like it was last year. It may need to be sheared again, but after the Iris blooms it will be much easier to do so. Yesterday, I had to cut stem by stem, separating the Irises from the Tansy. It was quite the project....which is probably why I kept putting it off. Only five little Irises were harmed during all that shearing....and they shall make me quite happy gracing my kitchen window, for as long as they last. 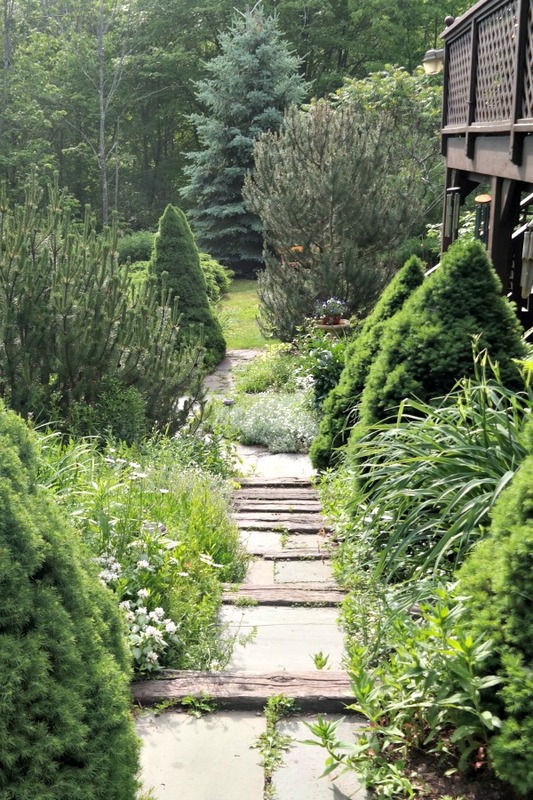 The large perennial bed is to the left as you head down the garden steps. There are perennials on both sides, as well as throughout the property, but this is by far the largest perennial bed. It's also eventually going to be part of my secret garden. I'm still working that project out in my mind. And yes, there are weeds growing in the cracks. But in fairness, some of them are pansies and violas....so I may just let them stay. 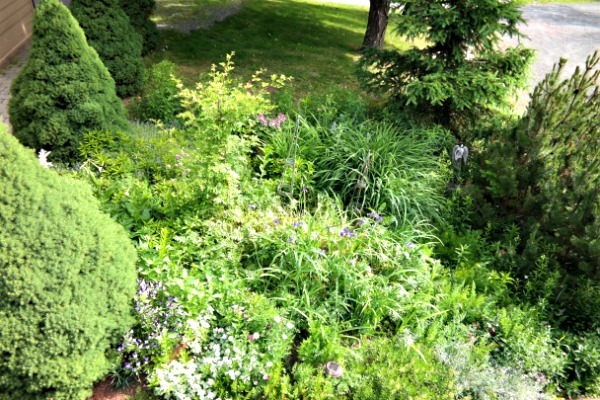 This is what the perennial bed looks like from the deck above. The color comes in waves, as various perennials come in and out of bloom. The evergreens, the obelisks, and my sweet garden angel add structure to the wild nature of my cottage garden. There's a ton going on in this space, and as I continue to get to know the garden and add my own plants and accessories, I am even happier with the garden as a whole. 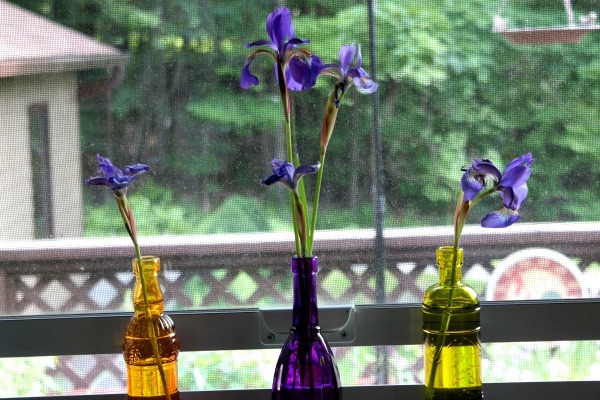 The Irises that I freed from the Tansy jungle are absolutely lovely. I have no clue what kind of Iris this is. It's rather small....if anyone has any ideas, I'd love your thoughts! The markings on the petals are so unusual, almost tribal. 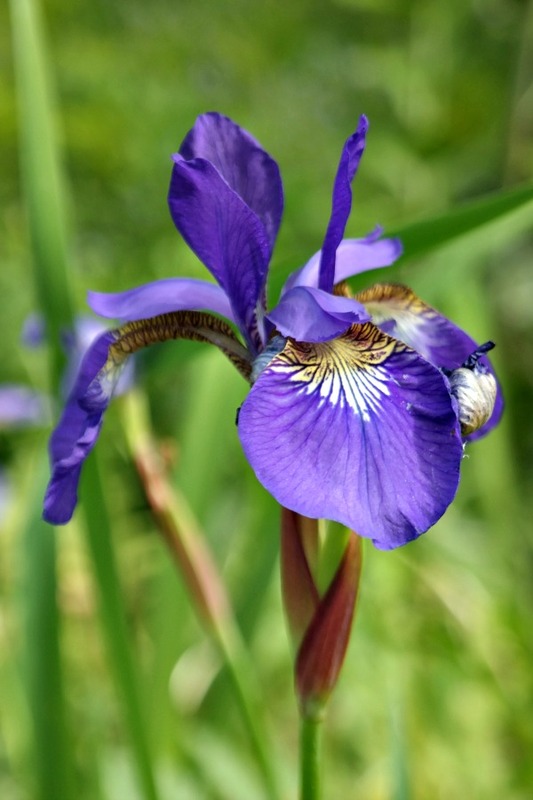 And the delicate nature of these Irises are just lovely. The Lamb's Ear is just about to bloom. 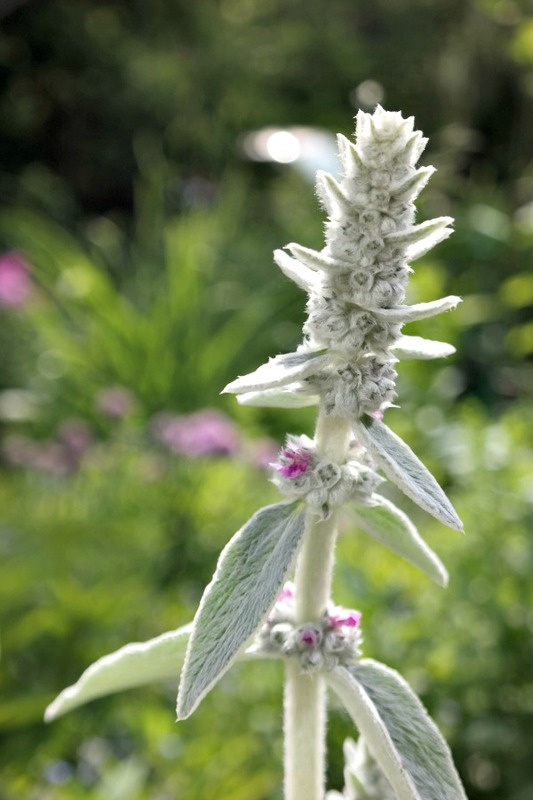 In the past, I wasn't the biggest fan of Lamb's Ear, but I have grown to appreciate the way it brings light and texture to the garden, with its unusual silver foliage. It plays beautifully off the golden leaves of the Evening Primrose. 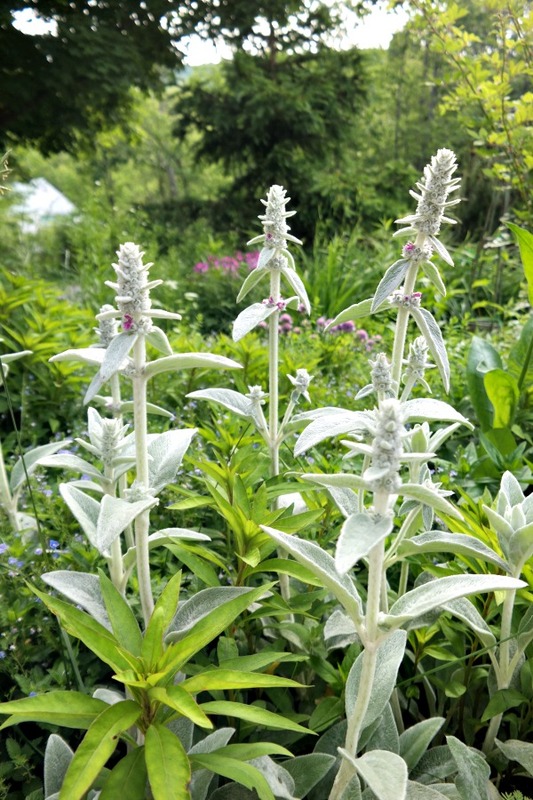 You can certainly see how this perennial came to be known as Lamb's Ear! 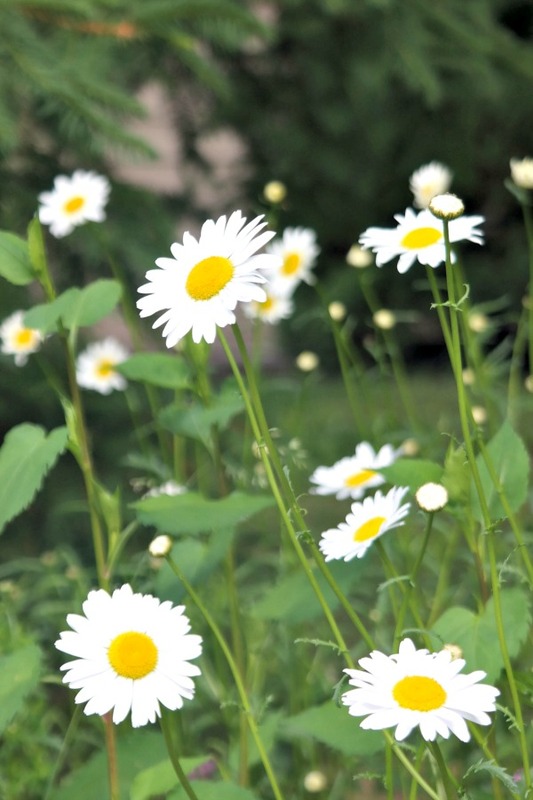 There are Wild Daisies blooming everywhere throughout the property right now. I adore them and don't mind letting them ramble among the perennials - they make me smile, and they bloom for such a long time. How could you not smile looking at that happy little flower? 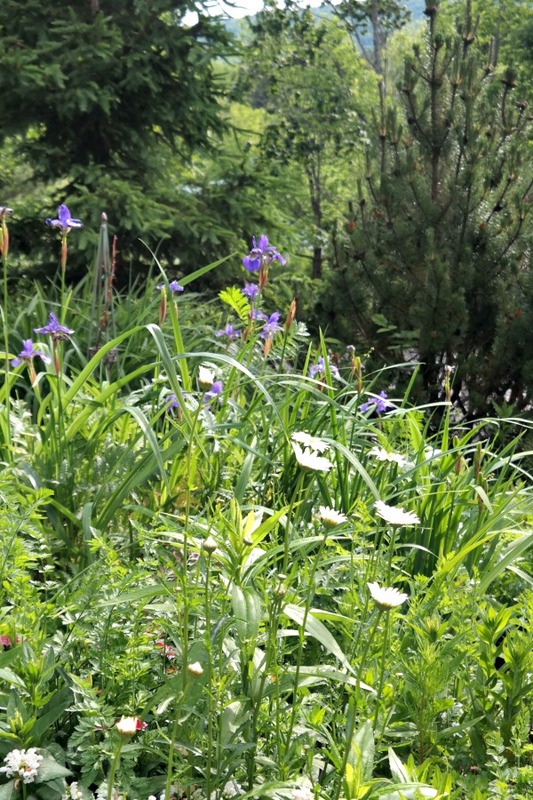 The Daisies mingle nicely with the Irises, they are a perfect pairing. Mother Nature sure knew what she was doing, popping those little Daisies in right next to the Irises! There's Dianthus popping up here and there....it's a little buried underneath another perennial, but since I don't recall what the other perennial is, I'm hesitant to pull it or cut it back. Time will tell. The Lamium, or Dead Nettle, I put in last spring is doing very well. I put in three plants each of the white and the purple variety, up the garden steps, on either side. 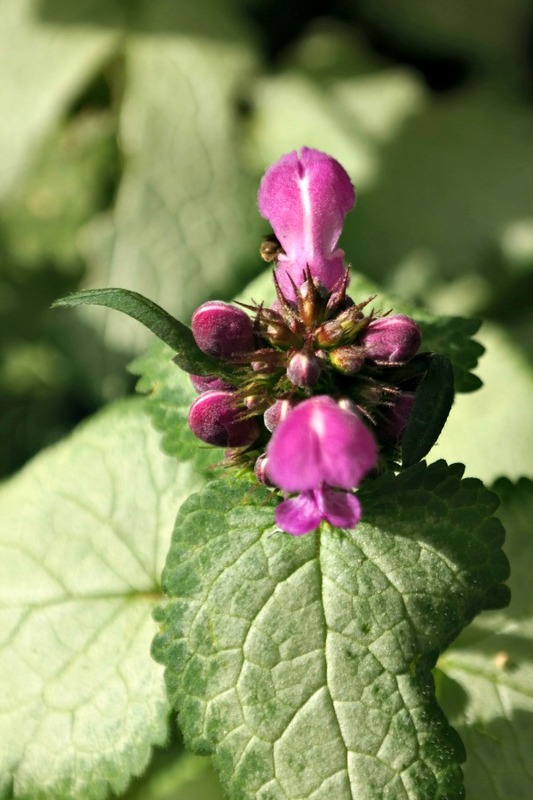 It adds a nice splash of light foliage to those areas, and Lamium is super easy to grow. An added bonus? The bees love it! 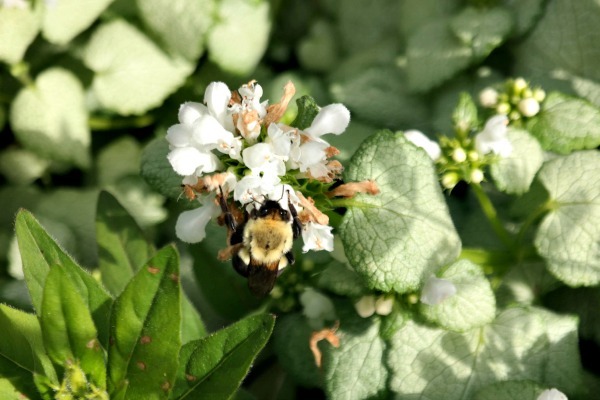 And since I love the bees, and want to welcome them to the garden, this is a win-win for me. There's such a constant hum of happy bumble bees around my garden right now....I definitely notice far more bees this year than last. I'm hoping they are increasing around my property because I plant flowers that they like, and because I garden organically. That will most definitely help the vegetable harvest, since we need the bees to pollinate the flowers on the veggie plants to produce an abundance of tomatoes, peppers, squash, etc. 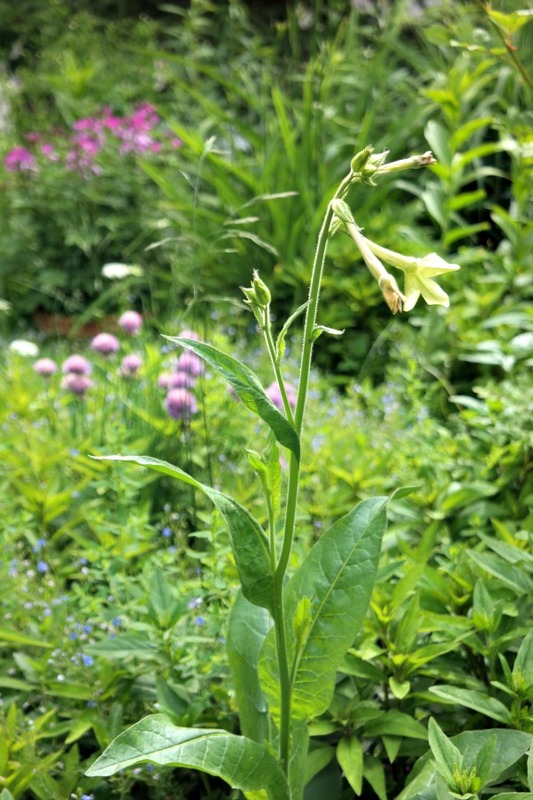 The Nicotiana I ordered from Annie's Annuals has just started to bloom, and I truly think this is going to be one of the stars of the garden this year. 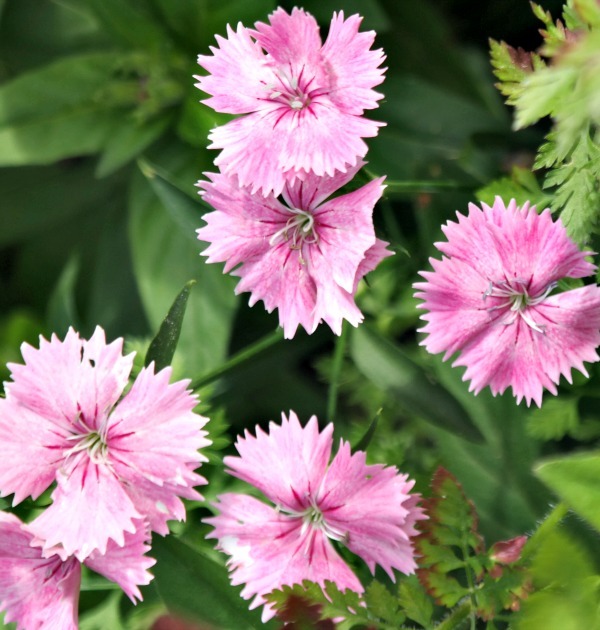 The flowers open fully in the evenings, and they are highly scented. The white flowers absolutely glow in the evening light, which is one of the reasons I use so much white in my gardens. And anything that is highly scented is a winner with me! This plant is already about 3 feet tall, and depending on which variety this Nicotiana is (I put in two varieties), may get up to 8 feet tall - can you imagine what a show stopper that will be? 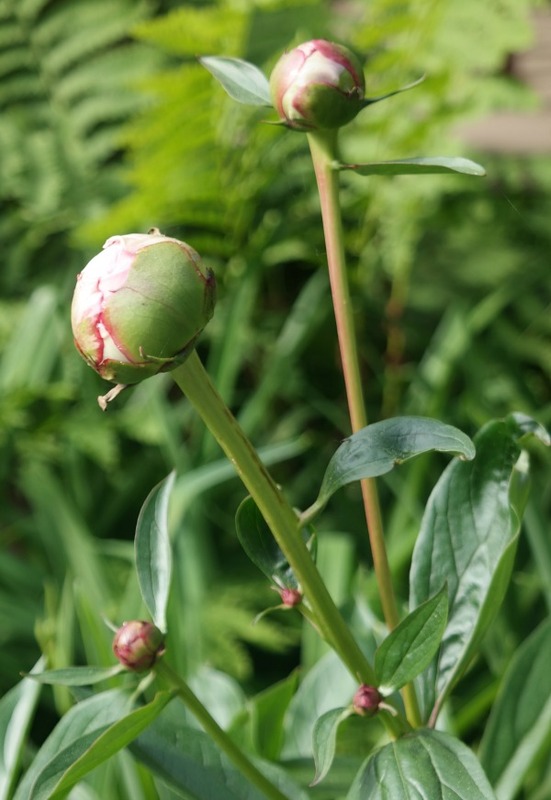 Speaking of show stoppers, the one and only Peony that was in the garden when I bought the house is about to bloom. Last year, I got a mere 3 blooms from it. I cut them and enjoyed them in the house. This year, there are at least 20 blooms or more on the Peony - I'm delighted!! I planted 10 more Peonies this year, and I see 6 of the 10 are doing well. Four never made an appearance at all, from what I can tell. I doubt I will get any blooms on the 6 this year, but starting next year, my Peony show will be getting better and better with each season. So, that's what's blooming in my perennial bed right now....there's lots more happening around the property, but that's enough picture overload to torture you with for one day! On another note, the slugs that were destroying my gardens seem to be finally under control. I will keep applying the product I bought, Sluggo, throughout the season, if need be. And, although I hoped and prayed the bear may have moved on, yesterday proved a very different story. It changes every single day, Marty - I can't even keep up with photos right now! 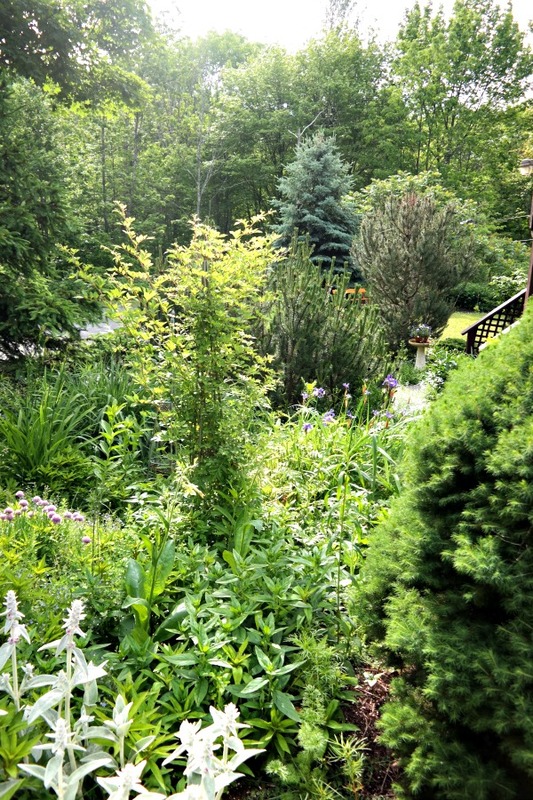 Such a lovely New Englandish perennial garden, mixed in with the evergreens! And the tansy after pruning picture does show it looks better now, tedious task that it must have been. I've never been able to get Lamb's ears to bloom, and would love to see your garden at night--under a full moon! It's absolutely glorious for sure, Dewena - and when the Casablanca Lilies bloom? Pure heaven! Those irises are gorgeous! Nice established perennials. I envy your lushness, our mountain side is more like the Sahara...lol! I was fortunate to buy a home from people who loved to garden! Your garden is so lovely! Mine is definitely overgrown already this year...so much rain...and so little time to tend to it. Don't you feel like you need a clone at times, Linda? Your garden is just amazing. How lovely it must be to walk down those garden steps each day. Is it time for Advil? Never mind the advil, give me a martini!! That darned Tansy shows up everywhere!! I shall have to see how it is now that I've cut it back - I don't mind the blooms in the fall, but it's just too darned tall and floppy!! I'm sort of in the same boat as you....we bought the lake house a couple of years ago, but just moved in on more of a permanent basis last October. There are plants coming up, surprising the socks off of me. And then, I might not know the plant at all which leads me to research what it is and how to care for it. The most surprising and most cherished of all is the one Peony I found in the back yard. Your gardens look great! Peonies are the best surprise, aren't they? I planted 10 more this year, and can't wait until they are all flourishing in years to come! Great gardens! No wonder you were hesitant to get into that tansy - I can see you'd be walking on the other plants just to access it. That's partly why I ended up taking out 3 of my hydrangea - they had overgrown to the point where I couldn't get around in my beds to the point where it was frustrating me (my husband long before that). I do love a cottage garden look, though, I just compromise with my Mr. 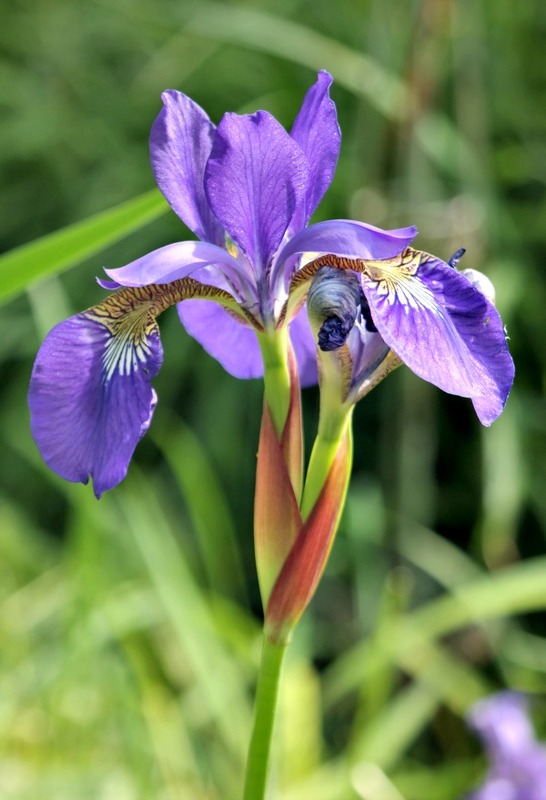 Your iris looks like mountain iris, maybe the Douglasiana variety. Beautiful. Looks as though your region is about 1 month later than ours, but it's so nice to see the blooms again. I'll be watching for the bear sequel....have a great weekend. I'll have to look up that Iris, thanks, Rita!! Apparently Tansy has many uses, one of which is to make tea? I found that out when I was trying to figure out what the heck to do with it! I think it makes a nice dried flower also....if I had time to dry it last year I guess I would have found out! Everything is just beautiful! I love irises, daisies and also the peonies. Your gardens must take a LOT of time and hard work. Well worth it, I'd say! They sure do, especially in the spring and fall, Pat. But they are worth it!! What lovely combinations of blossoms you have. Love the daisies and irises together, unique contrasting of colors and textures. It's getting there, Daisy - and more and more blooms arriving daily! 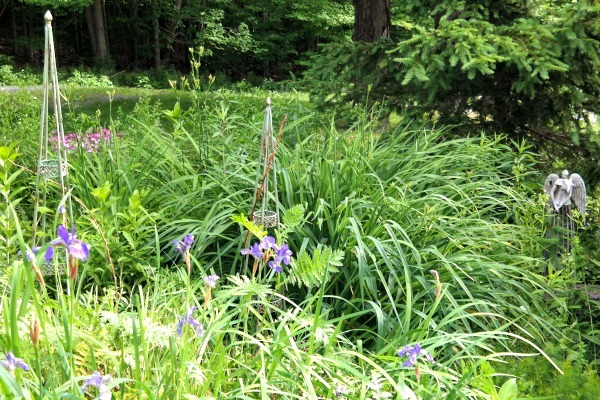 I used to have Japanese Iris in a very wet spot in a previous garden - they are amazing right near a creek or pond! Thanks for your visit, Mamuka! Most definitely, Doreen! And wouldn't it be fun to have a maid and a gardener to help out - ha ha!! The lamb's ear, the golden rod, the daisies ... all beautiful. Thanks!! 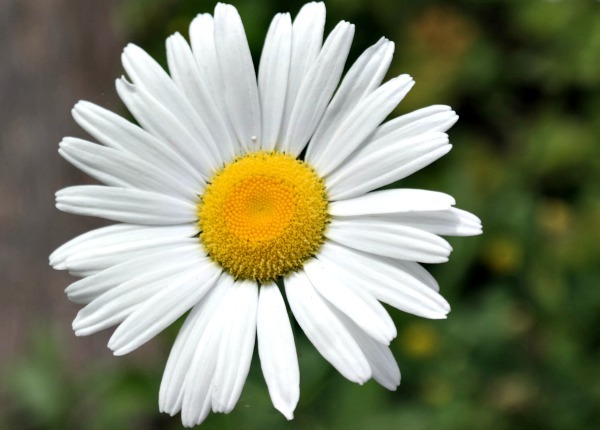 The daisies are going mad right now! I'd love to see the nicotiana glowing in the evening light. The lamb's ear is really interesting - I don't think I've seen it before. Everything taken together makes for a beautiful garden! Thanks for linking up at Best of the Weekend! The Nicotiana is just lovely, and the scent is heavenly, Amy! !